Dowling was the number 3 ranked man in the April 1916 pay list, after Keogh and Quinlisk. They got 10 marks and 9 marks, Dowling got 8 and the other two sergeants (O'Toole and Bailey) got 7 marks. He transferred to the Connaught Rangers on the 16th of August 1904 and was put on the Reserve on the 17th July, 1907. 1901 in census with parents at The Well Road formerly New Road, Maryborough, Queens Co. 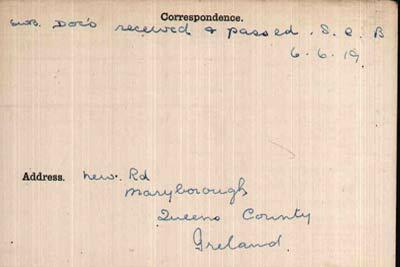 This was still his address on Connaught Rangers records when he was captured. On the outbreak of the First World War he was called up and posted as Lance Corporal to the 2nd Battalion of the Connaught Rangers on the 5th August, 1914. 8243 Cpl Dowling J of 3 New Road Maryboro, appears on a list of Connaught Ranger POWs. 1915 Apr 27. Quinlisk and Dowling meet Plunkett in Berlin in the Hotel Bristol. 1915 Jul. All 56 men in the Brigade were moved to another camp, Halbmondlager, Zossen. This was a camp that house 3500 mainly Muslim prisoners of war. They were there until November 1915, at which point they were moved again to Weinburg Camp, where there was a large number of Russian POWs. They stayed at Weinburg until July 1916, when they were again moved, this time to Danzig Troyl, where there was 40,000 Russian prisoners of war. There he remained until April 1st 1918, when the Germans took him Wilhelm's Haven where he got on the submarine bound for Ireland. 1916 Jul. Dowling goes into hospital for an operation. Mahoney describes Dowling as the man in charge of the Irish at Danzig, and when Dowling left for Ireland, Kavanagh took charge. I am not clear where this leaves Keogh and Quinlisk at that time. Though Keogh was away at the front from may 1918 onwards. Mahoney wrote "Dowling with Zerhusen were the two in charge in the camp at Danzig, who used to try to obtain parcels by trickery from the charitable institutions in England. Dowling was in charge of the Brigade, and when Dowling went over to Ireland Kavanagh took charge. But it was too late to obtain much more success with the parcel scheme." 1918 The reasons for Dowling's journey to Ireland have never been clear. However Kavanagh's memoirs shed some light on it. As with Keogh, it is difficult to separate boasting from reality with these men's memoirs, but there appears to me to be so much detail in Kavanagh's account that the outline is undoubtedly true. Dowling was to go to Ireland to set up a communication channel for the Germans to send arms to the west coast of Ireland. Once landed, Dowling would send messages to the men in Germany via POW parcels to (fictitiously) men already receiving parcels. The message would be hidden in the contents, and they had worked out a way of checking if the message had been read or not.. The message would give a place for delivery within a 3 week window, and would ensure that personnel and transport were available to carry the weapons away. To prepare him for the task, Dowling was sent on a 3 week training course under Submarine Instructor Captain Brandy of the Kiel submarine base. Unfortuneately there was no German Naval officer of the name Brandy or Brandi serving in WW1. Nor are there any suitable candidates under Brand, Brande, Brandes and Brandt. If Dowling's attempt failed, then apparently O'Toole and Delamore were to go together to make the next attempt. 1918 Mar 17. Some of the NCOs were invited to the St Patrick's Day dinner in Berlin of the German-Irish Society at the Hotel Adlon. In the event only Dowling attended. Gaffney was one of the organisers. Dowling went with Zerhusen and they stayed 2 days at the Hotel Adlon before returning to Danzig. Dowling received his briefing for Ireland during this stay. encouraging Dowling to get drunk too much. Dowling hints that he, Dowling, may have an alcohol problem. selling the Brigade gramophone, iron and boots to obtain money. 1918 Apr 12. So it came to pass that Joseph Dowling landed in a small rubber dingy off a German U-Boat in the early hours of Friday, April 12th, 1918, off the coast of Co. Clare and landed on the beach at Crab Island, half a mile off the mainland. Realising that he was not in the right place, he managed to hail a passing fishing boat and get a ride to Doolin Point. However he had been spotted by a Coast Guard , one James O'Brien, on Crab Island, and when he arrived at Doolin Point he was taken to the local Coastguard Station where the Petty Officer in charge was not impressed by Dowling's tale that he had been shipwrecked, and the PO decided to send Dowling on to Galway to be interviewed by a senior Naval Officer. Quite bizarrely he was told to make his own way to Galway and buy his own ticket at Ennistymon railway station. 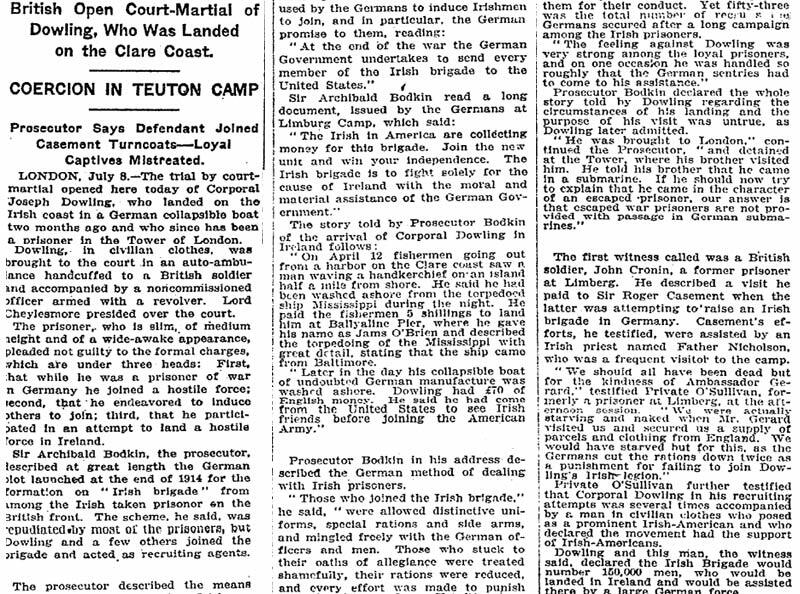 It is almost inevitable he British Intelligence knew he was coming, as German codes had been broken, but for fairly obvious reasons this was not mentioned at his trial. Commander Hanan was not convinced, and arranged for Joe to be taken to London and detained at Cromwell Gardens Detention Centre, where he remained until the evening of 16th April when he was handed on to the Metropolitan Police. Interrogation was conducted at New Scotland Yard up to the 22nd April, 1918, with Basil Thomson, the Director of Naval Intelligence, Colonel Hall and Curtis Bennett. It was at this stage that he admitted to his real name of Joseph Dowling and that he had landed in Ireland by German submarine. At one of these meetings, the Director of Naval Intelligence told Joe that if he cooperated and told the truth his life would be spared. This promise later turned out to be the thing that saved him from execution. Three charges were made against Dowling. One was that he enlisted into that Irish Brigade; the second was for having induced others to enlist in it; and the third was having embarked on board a certain ship with German civilians or sailors. The first charge is hardly denied; the second one, that he enlisted others, is denied and it is a doubtful question that it was proven. The third charge is down to his having admitted it. In jail Joe Dowling petitioned politicians for clemency and a transfer to an Irish prison so that his parents could visit him more easily. Petitions he made on 8th May, 1919, and 7th June, 1920, were rejected. He had a brother who visited him in jail. However wheels were in motion, and on 6th of May, 1922, a secret letter was sent to Sir Herbert Creedy at the War Office by Lionel Curtis, secretary to the Provisional Government of Ireland Committee of the Cabinet, stating that “... Mr. Churchill attaches great importance to his release, and will indeed be in a very difficult position if it is refused ... the Government having released everyone else whose crime was political ... it is almost impossible to frame intelligible reasons why this man should not be amnestied." However The War Office refused to release him on the grounds that his crime was military and not political. Later that year the Secretary of State for the Colonies asked the War Office for a précis of Joe Dowling's case and this was duly forwarded. In January 1923 President Cosgrove became involved in discussions to free the Connaught Ranger mutineers and Joe Dowling. London intimated that they were prepared to release the mutineers but not to release Joe Dowling. 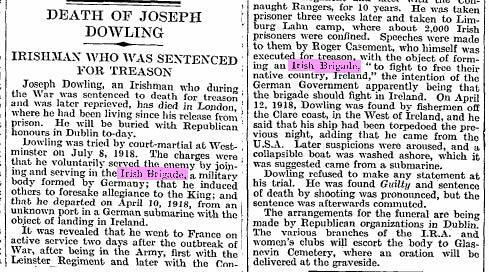 and the Irish government reluctantly agreed to the British position on the release of the Connaught Rangers but not Joe Dowling. 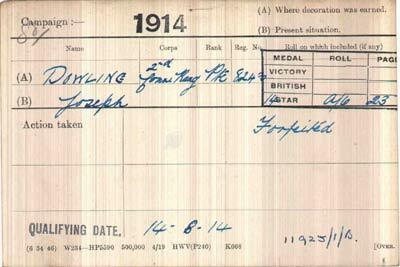 On the 24th May, 1923, Joe Dowling requested a copy of his Court Martial proceedings for which he had to pay £5.17s. 8d to the British Government, the wheels of bureaucracy grind remorselessly. The Irish government continued to press for his release. The matter was debated in the Irish Senate on 4 July 1923. On the 7th July, the War Office once more refused. General Mulcahy, the Minister of Defence for the Irish Free State, wrote to the Earl of Derby at the War Office on 13th November urging his release, but in vain. When a prisoner of war, voluntarily serving with the enemy, by joining and serving in the "Irish Brigade." When a prisoner of war, voluntarily aiding the enemy by persuading other British prisoners of war to join the armed forces of the enemy. When a prisoner of war, voluntarily aiding the enemy by going to Ireland in a German submarine with the object of aiding the King's enemies in prosecuting the War against His Majesty. He was sentenced to death, but the sentence of death was commuted to one of penal servitude for life, and that sentence he is still serving. It is obvious that a serving British soldier who not only leaves his own service, but who joins and takes an active part in that of an external enemy in a time of national peril cannot be placed in any such category. His Majesty's Government therefore, after giving the most careful consideration to the matter, have reluctantly come to the conclusion that they cannot advise His Majesty to vary the sentence imposed in this case. A secret paper included the words "Secretary of State for the Colonies thinks the moment has come for the release of Dowling, no difficulties will be raised on military grounds. You were good enough to say that you would try to arrange for the release to be effected with as little publicity as possible, at any rate on this side of the Irish Channel." 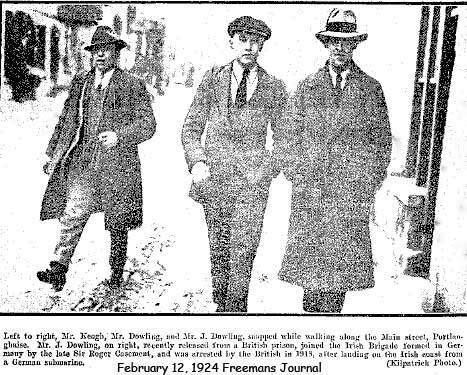 A speedy legal document was drawn up and on the 2nd February, 1924, King George V signed a paper annulling the sentence of penal servitude for life passed on Joe Dowling. He was released from Liverpool Prison and escorted home by an official of the Irish Free State. ...I Joseph Dowling, landed in France in the 14th of August 1914, with a unit of His Majesty's expeditionary force, we then proceeded to the north of Franc(e), and thence to Mons where we landed on the 23rd of August. On the 27th of August after some heavy fighting I got separated from my regiment, the same evening I was attached to the 306 French Regiment and remained with them until the 3rd of September on which date I was captured ... 1 was taken to Sennelager (Germany) where I remained until the 22nd of December, on which date all men belonging to Irish Regiments, were collected together and taken to Limburg A.D. Lahn (a prisoner of war camp) where I remained until July 1915. On the 27th of March 1915. I became a member of an organization known as the Irish Brigade. In July we the 54 men(?) Brigade, were taken to a prison camp in Zossen bie Berlin. (the prisoners of this camp were French and coloured troops) We remained there until November, we were then removed to Weinburg Camp, where there was a large number of Russian prisoners of war, here we remained until July 1916, we were then taken to a prison camp (Danzig Troyl) where there was 40,000 Russian prisoners of war, there I remained until April 1st 1918, I was then conducted to Hamburg and thence to Wilhelm's Haven where I embarked for Ireland. I make this statement to show that I have been a prisoner of war for 3 years and 7 months. I was charged with voluntary joining an Irish Brigade. One cannot call an unarmed body of men a Brigade, also when one is deprived of his freedom he cannot voluntarily do anything, only through weakness, uneducation or perhaps force. I was charged with voluntary serving the Enemy. Well, I was a prisoner of war for 3 years and 7 months, an opportunity came my way to get home to Ireland, and to get there I was forced to accept whatever means they supplied me with, and that means was a submarine, not I think any man circumstanced as I was would not be serving voluntary. He married Henrietta Hovenden, his second cousin, on the 23rd October, 1926 at the Church of Our Lady of the Hals in St. Pancras, London. He was 40, she 61. They lived in Hampstead, North London, until his death on the 1st August 1932, at the Fulham Cancer Hospital. His remains were taken back to Ireland in the Holyhead boat . At Dun Laoghaire they were met by Fianna Fail representatives and members of the Dublin Brigade, I.R.A., and of the Cumann na mBan organisation. The coffin, draped in the tricolour and Dowling's Irish Brigade hat on top, was transferred to Westland Row Church for a Requiem Mass. Among those who attended the Requiem Mass were: The deceased's widow and mother, Sergt.-Major Michael Patrick Keogh, Sergt. Michael O'Toole, Sean Kavanagh, M Dowling, John Greer, Irish Brigade Volunteers; Sergt. Sean Casement; Mr. and Mrs. John Nicholson,and a number of the Connaught Rangers Mutineers. Close on a thousand people attended. His last wish was to be laid to rest with the men of 1916, with whom he had hoped to fight and strike a blow for the freedom of Ireland. Even at Dowling's funeral the Irish Brigade men got shouldered aside by the assorted politicians who turned up for the event.